Resizing your image one by one can be a time consuming task. Imagine if you have hundreds or thousands over images that you would like to resize? How much work will be needed and time will be wasted? 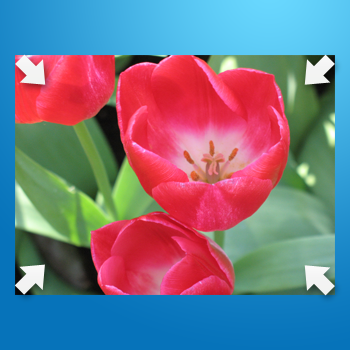 Instead of resizing your image one by one, you can use Photopus freeware to automatically batch resize images. 1. Download Photopus freeware from http://www.photopus.net and install it. 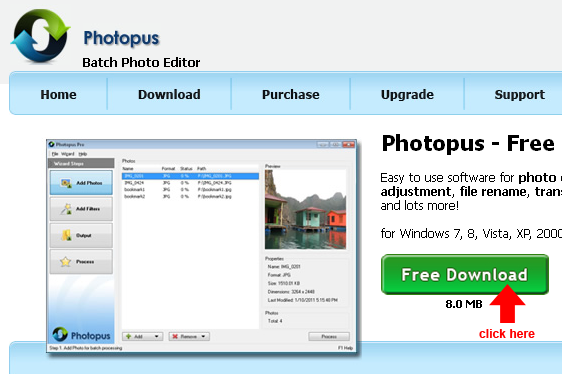 Photopus runs on Windows 7, 8, Vista, XP, 2000, 2003, 2008 . 2. Open Photopus after the software installation. 3. Click on the Add button at bottom to add images for batch resizing. You may choose to add images individually or by folder. There is no limit on the number of images. 4. You shall see the added images on the listing. 5. Click on Add Filters button to proceed to the next step. 6. 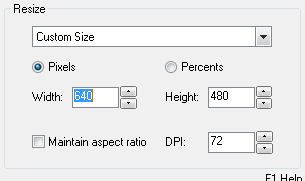 Under Resize options, we'll be setting the batch image resizing criteria. 7. 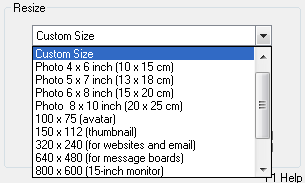 From the list of resizing options, select Custom Size. Now enter the preferred new image width and height. You can also set to maintain the image aspect ratio after resize or change the DPI. 8. Click on the Output button to proceed to the final step. 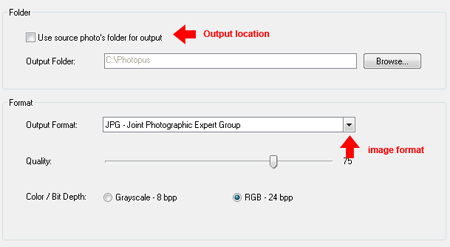 Under Output, we'll be setting the output image format and also the output location. 9. By default Photopus will save all the resized images in C:\Photopus. To change to another output folder, click on the Browse button. 10. Now click on the process button to start the image resizing. Depending on the number of images you've added for resizing, the entire process shouldn't take long to complete. 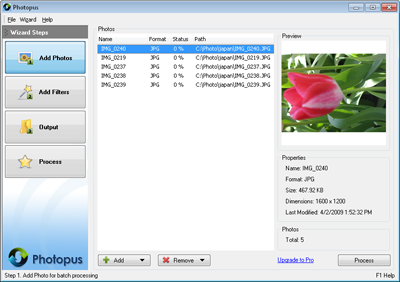 Immediate the process is completed, Photopus will play a notification sound and open the output folder.